The Bob & Ronna Group, Veteran Owned and Operated, is proud to partner with the Marine Toys For Tots Foundation to collect toys for children who are less fortunate in our region. Stop by The Bob & Ronna Group office between 9:00am and 5:30pm, M-F, to donate any unwrapped new toy, large or small Now through December 5th, 2017. Let’s make this an enjoyable Holiday for as many Children in our local community as possible. The Need Is Great. 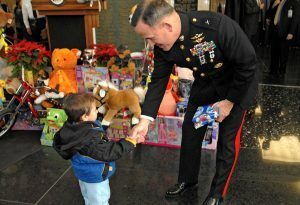 Last year, The Marine Toys for Tots Program collected and distributed 18 million toys to 7 million less fortunate children allowing them to experience holiday joy and receive a message of hope that otherwise would not have been there. Your Donation Will Benefit Local Children! If you are unable to drop off an unwrapped new toy, click on the Toys For Tots logo above and make a monetary donation directly to the Marine Toys For Tots Foundation! Thank you in advance for your support and generosity this holiday season.